The Series 79 exam—the Investment Banking Representative Qualification Examination (IB)—assesses the competency of an entry-level registered representative to perform his or her job as an investment banker. The exam measures the degree to which each candidate possesses the knowledge needed to perform the critical functions of an investment banking representative. This includes advising on or facilitating debt or equity offerings through a private placement or public offering, and advising or facilitating mergers and acquisitions, tender offers, financial restructurings and asset sales. The Series 79 consists of 175 scored questions and an additional 10 unscored pretest questions. Candidates have five hours to complete the exam. The passing score is 73 percent. The provides a comprehensive guide to the range of topics covered on the exam, as well as the depth of knowledge required. It includes sample questions to acquaint a candidate with the types of multiple-choice questions on the exam. The outline consists of the four main job functions of an entry-level Series 79 representative. The Series 79 does not have a prerequisite exam. The table below lists the allocation of exam questions for each major job function of an investment banking representative. 1. I engage in investment banking work that is limited to structuring private securities offerings at my firm. What registration(s) will I need to engage in this activity? You may register as either an Investment Banking Representative (IB) by passing the Series 79 Exam or as a Private Securities Offerings Representative (PR) by passing the Series 82 Exam. 2. My firm’s business is limited to both structuring and selling private securities offerings. What registration(s) will I need to engage in both types of activities? 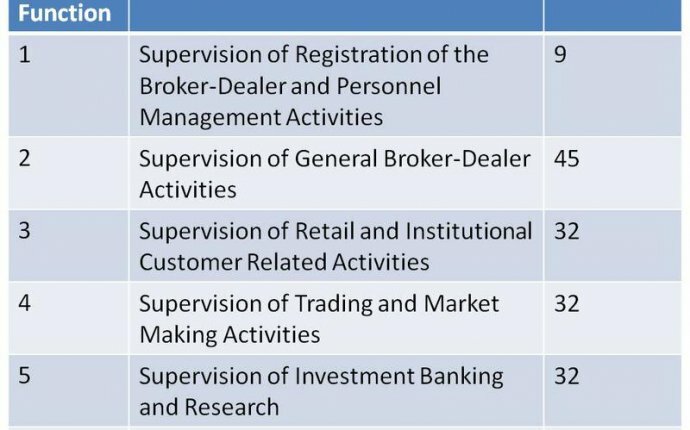 You have two registration options for engaging in these activities: (a) register as a Private Securities Offerings Representative (Series 82) or (b) register as an Investment Banking Representative (Series 79) and either as a General Securities Representative (Series 7) or a Corporate Securities Representative (Series 62). 3. I am registered as an Investment Banking Representative (Series 79) under NASD Rule 1032(i) Limited Representative-Investment Banking. The rule states that persons whose activities involve “advising on or facilitating debt or equity securities offerings though a private placement or a public offering, including…marketing….” must register as an Investment Banking Representative. Does this mean that I can engage in road show activities and direct selling efforts related to a debt or equities securities offering without obtaining any additional registrations? The Investment Banking Representative registration category is meant to include investment bankers, who as part of their job activities, advise on or facilitate the marketing of an offering. This would include activities such as preparing a marketing plan, advising on a marketing plan prepared by a sales team or developing and/or contributing information for marketing materials. However, it would not include persons who actively market the offering and interact with investors or potential investors, such as a person who is engaging in road show activities. Such a person would also need to be registered as a General Securities Representative (Series 7), Corporate Securities Representative (Series 62) or Private Securities Offerings Representative (Series 82) depending on the type of offering being made. 4. I am registered as a General Securities Representative (Series 7) and engage in both the sales and marketing of private placements and public offerings. Do I need any additional registrations? If you are only engaged in selling the offering or actively marketing the offering to investors or potential investors, the Series 7 registration is sufficient. However, if you want to engage in activities such as preparing a marketing plan or advising on a marketing plan prepared by a sales team or developing and/or contributing information for marketing materials, you would also need to be registered as an Investment Banking Representative (Series 79).